Voluntary exposures will be video recorded and a copy will be provided to student for their own training records. All students will receive a certificate. Devices known as Taser* is a Conductive Electrical Weapon or CEW and have changed the Use of Force Continuum in the bail fugitive recovery industry however, do you know how to use the CEW device in a Self-Defense situation without exposing involved persons to potentially harmful conditions or civil liability? To protect liability you should be trained by a Conductive Electrical Weapons Certified Instructor. The course taught is always the most up-to-date publications containing current laws and CEW models. BAIL AGENT CEW ADVANCED COURSE - Satisfy your annual 6-hour bail agent continuing education requirement and receive two certifications at the same time with 4-hour CEW combined with 2-hour arrest control / weapon retention course. BOUNTY HUNTER / SECURITY CEW ADVANCED END USER TRAINING - Are you, your bounty hunters or security officers carrying a CEW (Taser*)? Protect yourself from potential liability! Get yourself, your bounty hunters or security officers CEW end user trained. Class is combined with 2-hour arrest control / weapon retention course. Both Conductive Electrical Weapons Advanced Training courses cover use of TASER M18/26 CEW, TASER X26 CEW, TASER X26P CEW, TASER X2 CEW TASER X3 CEW, TASER C2 CEW and TASER PULSE. 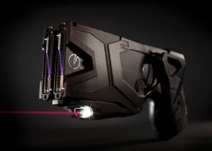 *TASER is a trademark of TASER International, Inc. registered in the U.S. and other countries.